Not every overwater bungalow is the same — even at the same resort in the same category. Position matters big-time. Most overwater bungalows are strung together on long piers that extend out into the lagoon, and the most prized digs are located further out on the pier for maximum privacy. Not surprisingly, those are also the most expensive, and where you’re more likely to find cool extras like hot tubs or plunge pools. Few things are more romantic than these rooms, set on stilts over a crystal-clear lagoon with glass panels in the floor. 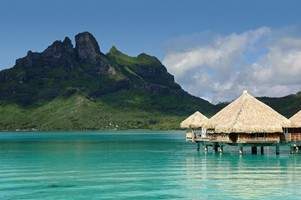 The concept was invented in the 1960s in Tahiti, and they have perfected the experience with bungalows to suit every style, from an oversized two-story, two-bedroom bungalow featured in The Bachelorette to bare-bones huts with thatched roofs and no A/C but lots of South Pacific ambiance. There’s no such thing as a bad overwater bungalow in our eyes (and we should know — we’ve toured a ton). Here are four of our favorites. Eco-conscious meets mod at this 83-villa resort. We love the lobby bar, with its airy white curtains, retro black-and-white photographs and unexpected Herman Miller marshmallow sofa. The spa is seriously amazing, with a hilltop jacuzzi that overlooks Mt. Otemanu, and thalasso treatments using nutrient-rich sea water pumped up from half a mile below the surface. This same technology powers much of the electricity for the resort, making it a standout in conservation. For bungalows, book an End of Pontoon suite for maximum privacy, and easy underwater exploration from lagoon-entry ladder from your deck. Inside, the king bed and bathroom tub are perfectly placed before windows for optimum views. Tahiti gets all the buzz, but The Maldives actually has more overwater bungalows than any other spot. Our friends who have been everywhere consistently cite One & Only’s outpost as one of the sexiest places they’ve been. We love the sheer decadence of the Grand Villa with Pool, with it’s wide, split-level terrace with infinity-edge pool and lagoon entrance, and a catamaran-style netting strung over the water for napping — bliss. Drink in the views at Tapasake, the overwater sushi/sake restaurant, and from the beachfront ESPA spa, named one of the world’s best by the UK’s Conde Nast Traveller. Even the main lap pool extends over the lagoon, for your morning workout. We usually like our resorts a little more understated, but this won us over with the sheer amount of bells and whistles; think if it as a Disneyland for adults, only set in Bora Bora. Spread out over 44 acres (you need golf carts to get around), they have everything was water sports (paddleboarding to scuba diving); Tahiti’s only sushi bar; a plush Clarins Spa; even a bridal salon selling airy white dresses by Norwegian designer Cecilie Mellie. Dinner at LAGOON by Jean Georges was one of the highlights of our last visit, as were the bungalows: seriously sweet, and the biggest in the South Pacific. We love the premier overwater bungalows, which offer a whopping 1,900 square feet of space inside, plus an oversized hot tub and day bed on the terrace. This private-island resort offers serious seclusion. 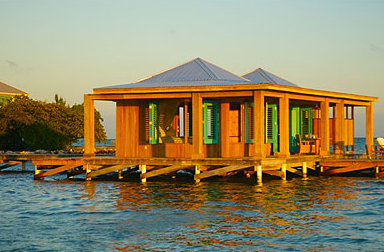 There are only seven cottages, and one — Casa Ventanas — is set on a pier extending out over the Caribbean. Inside are perks like Egyptian linen sheets, deck-front hammocks and chaises, and a pantry stocked with your favorite drinks and snacks. There’s no main restaurant; instead, everything is brought to your room, and the chef cooks meals based on your requests. When you want to mingle, you can snorkel or dive the neighboring reefs, explore Mayan ruins on the mainland, or hit the strip of beach bars on Ambergris Caye.